Los Alamos Daily Photo: Bandelier Is Tuff? Who says? Top: Looking east, across the Rio Grande Rift to the Sangre de Cristo Mountains. 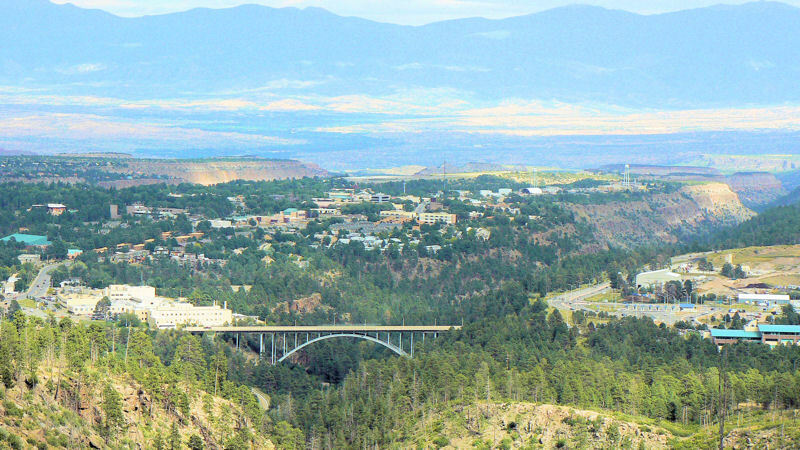 Los Alamos Canyon Bridge (also known as Omega Bridge). 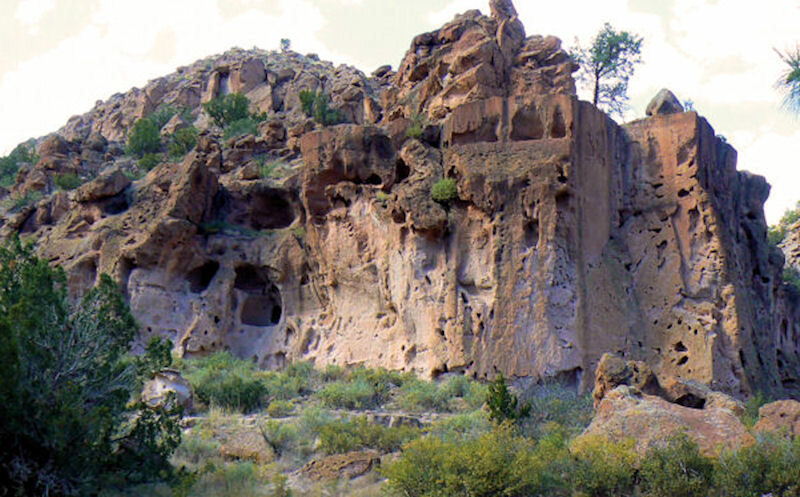 Los Alamos sits on several mesas formed by Bandelier tuff - volcanic ash-flows. Tuff is compressed volcanic ash flow and is easily carved out for cliff dwellings (see below). Lighter forms of the frothy lava called pumice is everywhere. Obsidian and hard dense basalt from lava flows also makes up the land we live on. See more at Geology of the Pajarito Plateau. Haven't visited that bridge for a long time now so I'd better go back again. One of my favorite spots in NM is Bandelier Nata'l Park (or whatever it's called) and I seldom miss a chance to visit it. It is hallowed ground. Pictures like this with the descriptive and Kate's comment make me wish we had the money to take off and tour the country. Some day! We were out of town so I'm catching up on your pictures. So, so beautiful. I have yet to travel to New Mexico, but through fellow City Daily Photo Blogers I have gotten a a good taste of how lovely and interesting it is. My parents retired to another desert area, but it hasn't the flavor of your area. Hey Larry, thanks for being the 500th person to follow SDP on Google Friend Connect! It's really fun that its a fellow blooger :-). beautiful pics. i found your site via the sequim daily photos blog.